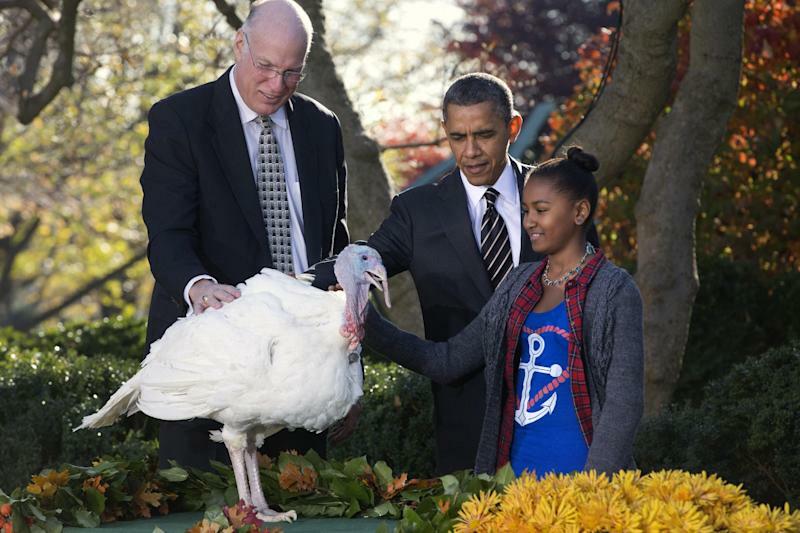 WASHINGTON (AP) — President Barack Obama pardoned two turkeys in an annual Thanksgiving rite on Wednesday, saying he wanted to offer the birds a second chance. "They say life is all about second chances, and this November I couldn't agree more with that sentiment," a smiling Obama said in one of several lighthearted references to his re-election this month to a second term. Cobbler, the newly designated national turkey, and his alternate, Gobbler, received a reprieve. "The American people have spoken, and these birds are moving forward!" Obama said in a reference to his campaign slogan of "Forward." 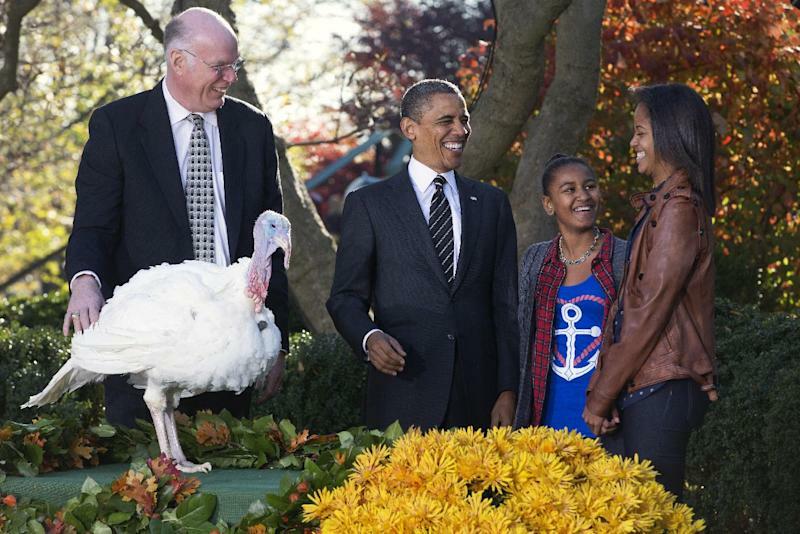 Obama noted that Cobbler and Gobbler were selected by the American people, who cast their votes for the national Thanksgiving turkey on the White House Facebook page. "Once again, Nate Silver completely nailed it," Obama said, referring to the New York Times blogger who correctly predicted the president's decisive victory in the Electoral College. Accompanied by daughters Sasha and Malia, Obama waved his hand over Cobbler in a vaguely religious "dispensation," then laughed as the bird gobbled loudly. 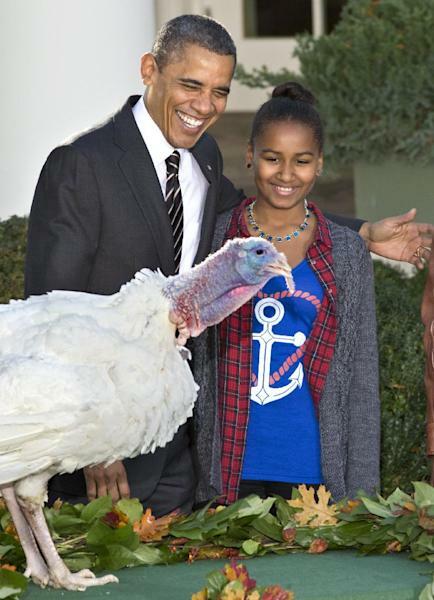 Obama and Sasha petted the turkey. Malia did not. "Congratulations, Cobbler. You're going to have a great life," Obama said. The 19-week-old, 40-pound turkeys are from Rockingham County, Va. They will live at George Washington's Mount Vernon estate, along with last year's birds, Liberty and Peace. Thanks to the American people, "the only cobbler anyone's eating this Thanksgiving will come with a side of ice cream," Obama said. On a more serious note, Obama asked Americans to remember those in the Northeast who lost their homes, possessions and loved ones to Superstorm Sandy. Obama, who toured New York and New Jersey after the storm, said he has seen much destruction, "but I have yet to find a broken spirit." Later the Obamas and the president's mother-in-law, Marian Robinson, went to the Capital Area Food Bank where they distributed sweet potatoes, carrots and other vegetables to those in need, including a group of children wearing bright yellow vests identifying them as part of the ECS youth program. Michelle Obama's brother, Craig Robinson, who coaches the Oregon State University men's basketball team, joined them, along with several team members. President John F. Kennedy spared a Thanksgiving turkey in 1963, but the practice did not become a formal White House tradition until President George H.W. Bush granted a "presidential pardon" to a turkey in 1989.